If you want to see Patient 0 for a goodly portion of American comedy, you really need look no further than The Marx Bros. 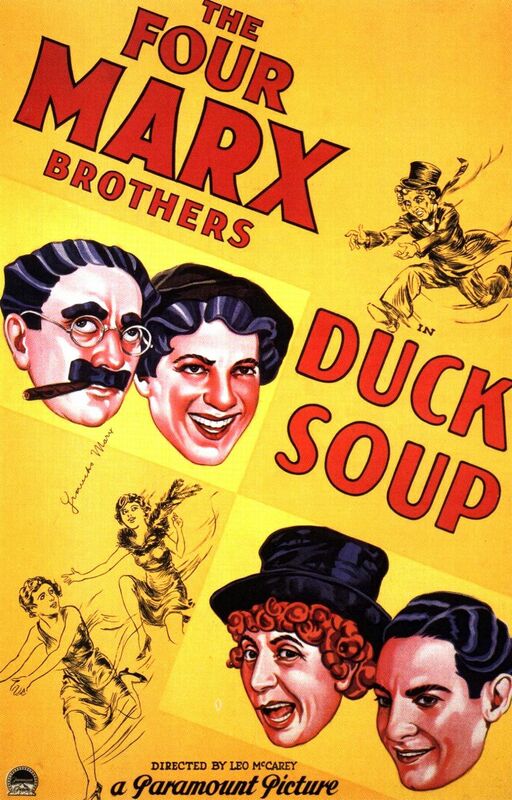 I can't even say the Marx Bros. are an acquired taste, because you either like them or you're dead inside. I've written before, at some point, that few things in this world please me more than Margaret Dumont, and she is very much in the middle of this movie. Here's our introduction to Rufus T. Firefly (Groucho) as he's introduced as the new Regent of the nation of Freedonia, thanks to Dumont, who has a crush on Firefly, getting him placed in office. Harpo and Chico play spies from the neighboring nation of Sylvania, and, eventually, there's a war between the two countries. Because. 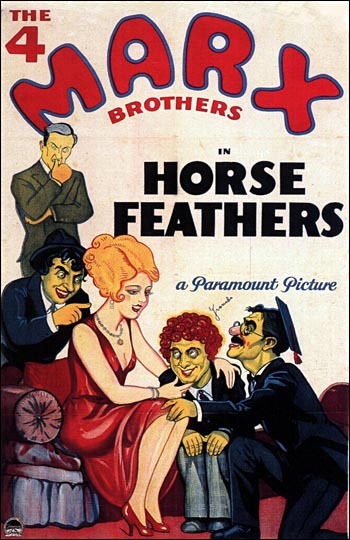 Anyway, this is one of my favorite of the Marx Bros. movies. 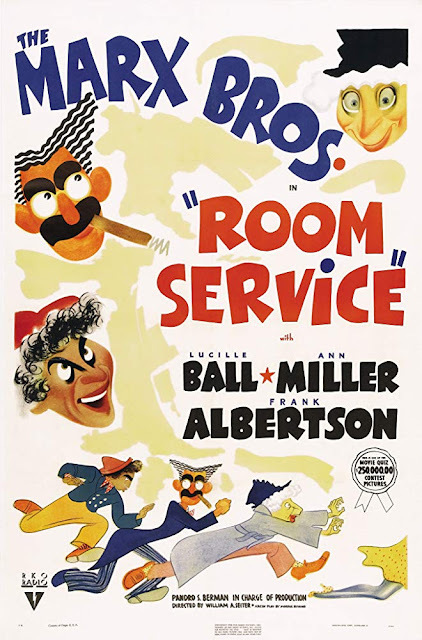 Sure, the set-up mostly seems like an excuse for the Marx Bros. to recycle bits from their vaudeville act, and that's okay. 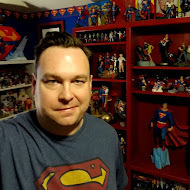 As Jamie rightfully pointed out - the thing about the Marx Bros. is that they don't rely on the sitcom formula of set-up, punchline, set-up, punchline that creates a sort of rhythm to the show (see: The Big Bang Theory). They just go for punchline, punchline, punchline, and you just need to keep up. If you've never seen it, well, it's a bit too late to catch it last night on TCM, but it'll be on again at some point. I am going to mention every single movie I watch this year. I'm sort of curious. Horse Feathers (1932) - The Marx Brothers. Nothing will beat Duck Soup for me, but I'd definitely watch it again. "Where's the seal?" won for best visual gag, but it had stiff competition. I'm a sucker for any Marx Bros. flick, and this was a better way to spend 1.25 hours than whatever else was on TV. Also, who doesn't like a movie about college football that includes cigar smoking on the field? The movie co-stars the lovely Thelma Todd, who has a pretty chilling Bio page on IMDB. Niagara (1953) - For something so amazingly noir, this was one bright, colorful movie. As I understand it, this was one of the movies that catapulted Marilyn Monroe to stardom, and its not hard to see why. We forget sometimes that she's not just a still shot, she was an actress, and a pretty good one. Not as good as Jean Peters (also an extraordinarily lovely woman), who is also in the movie playing a woman caught up in the noir story going on in the next bungalow over, but Monroe just fills a frame like few others, even when you know she's coming. Also stars the always terrific Joseph Cotten as Monroe's anxiety-ridden husband on the path to Dark City. And you will want to strangle Max Showalter (who would go on to play goofy Grandpa Fred in Sixteen Candles) for his corn-fed dorkiness. And starring Jean Peters! 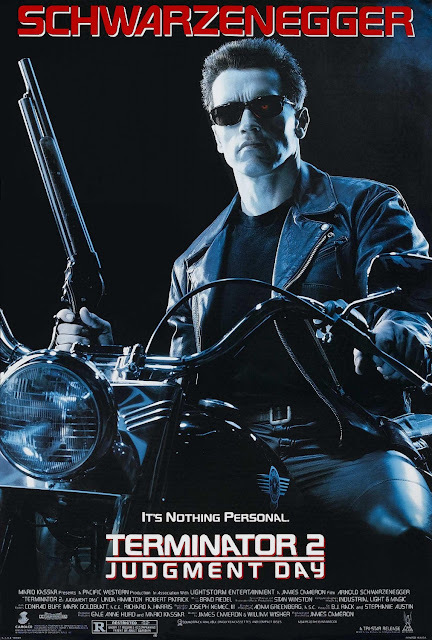 Who, yeah... on the poster? Is she one of those silhouettes on the bridge? No?